Perth is a historic place, doing well in ‘quality of life’ surveys. It’s one of Scotland's nicest cities, with an attractive rural hinterland. Here are some historical notes on Perth, (the Scottish one). It's one of our nicest cities. Walk the little city’s grid of streets and you soon get the impression it’s a place with a past. Basically, it goes back a long way. First of all Perth is a Scottish burgh. This notion of a 'burgh' was the backbone of urban Scottish life or centuries. The creation of burghs brought order, commerce, a sense of civic pride and – importantly – revenue-raising powers for the monarch. Though the Royal Charter that King William signed in 1210 is the earliest document confirming Perth’s burgh status, even earlier records place its burgh origins back in the first half of the 12th century, during the reign of King David I. Historically then, Perth stands in the very first rank of Scottish burghs. As described on the Scotland history page, one important feature of old Scottish burghs was the granting of a right to hold markets. From these commercial activities tolls were raised not just for the protection and upkeep of the burgh itself but also so that contributions could be made to the royal exchequer. (Pictured here.) 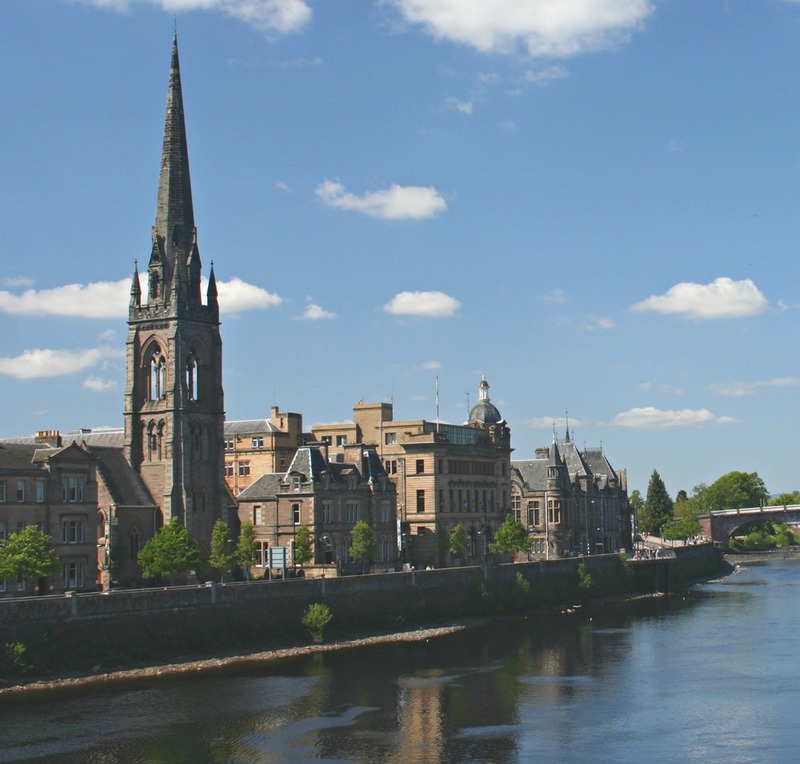 Perth in Scotland, the old heart of the city by the River Tay. Though Perth was a market centre for centuries, it is appropriate that the idea of a ‘modern’ farmers’ market in Scotland was first revived in Perth in 1999. And it still thrives today, though I must say (on a visit a few years back) the wailing country-and-western crooner or ‘street entertainer’ – loosely speaking – seemed at odds with the douce and tweedy shoppers eyeing up the smoked wild boar and other delicacies. Still, it’s best to be inclusive and to thrust gruesome old over-amplified tunes into people’s ears while they are trying to focus on the shopping list, I suppose. I really hope it’s changed though. The Golden Charter was the local description of a charter granted by King James VI in 1600. It not only confirmed all previous charters but also referred to Perth as a city. Thereafter, the title ‘City and Royal Burgh’ was a term habitually associated with Perth. From the early 19th century, it appears consistently in official documents such as Acts of Parliament and by-laws approved by the Secretary of State for Scotland. Why? Because in May 1559, Perth was the scene of a pivotal moment in Scotland’s story when the fiery Protestant reformer John Knox preached a sermon. Normally, at the end of kirk service these days, in Scotland, the (mostly) old ladies trip peacefully out and shake the minister by the hand. But not back then. Oh no. Knox’s words so inflamed the congregation that the burgh’s wealthy religious houses were sacked immediately afterwards. Anyway, this was the ignition point of the Reformation in Scotland and from that time onwards, the city’s monastic settlements, thereafter stripped and roofless, went into steep decline. Their stonework was gradually removed and re-used so that all traces vanished from Perth’s urban landscape. The uncertainties of the 17th-century Covenanting Wars and the aftermath, and competition from growing towns in other parts of Scotland were both factors that brought uncertainty to Perth’s future. The spirit and dynamism of the Enlightenment that re-invigorated Scotland also took root in Perth. By the 1760s the community broke free from its old city walls to create some of the most admired and elegant urban architecture in Scotland. Professor Smout, Scotland’s Historiographer Royal, has described this as a masterpiece of the early 19th-century art of town improvement. That’s why it’s nice to stroll around today, especially near the River Tay. It’s all just so comfortable looking. Perth’s waterfront, with Smeaton’s Bridge (right) and the former General Accident HQ, now part of the local cooncil, left. Anyway, by the end of the 19th century Pullars was Perth’s largest employer. Perth is also associated with whisky. Both Dewars and Bells are names central to the story of whisky distilling in Scotland and both had strong Perth links in their early days. Another ‘household name’, General Accident, was a business founded in Perth in 1885 – and had begun to insure motor vehicles by 1896. Other in-town activities included the manufacture of gloves, linen and also printing. Townscape-wise, by the early 19th century, Perth had a bridge by the famous engineer John Smeaton (opened in 1771) (pictured here) and also had built some of the finest Georgian architecture to be seen outside Edinburgh. Both bridge and buildings stand today. Perth’s ‘New Town’ took advantage of the fine views over the Inches (the former river-islands) to north and south. Amongst the city’s other cultural features are The Fergusson Gallery – in its present form representing one of the most imaginative conversions of Georgian work anywhere in Scotland. Today displaying a significant collection of works by the Scottish artist JD Fergusson, the distinguished rotunda and column overlooking the Tay at the end of Marshall Place were designed as waterworks and completed in 1832. 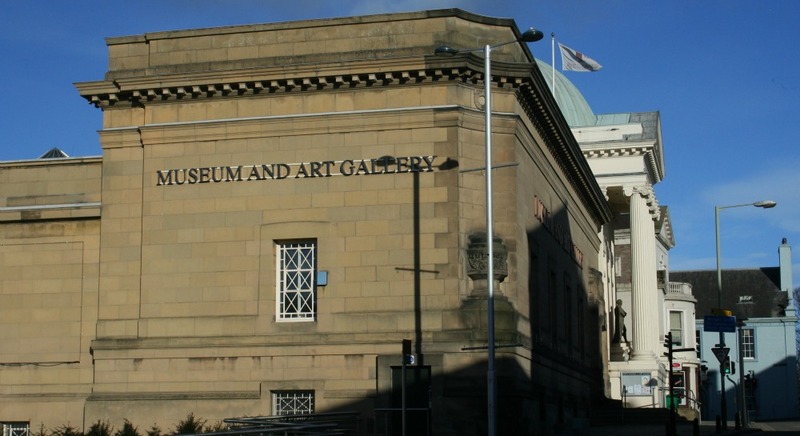 Meanwhile, Perth’s Museum and Art Gallery is not only one of the UK’s oldest museums, with more than half a million objects, but has been housed in its ‘custom-built’ and notable quarters since 1822. The dome of the museum frames the approach to Perth from Smeaton’s bridge and adds greatly to the special qualities of the urban landscape of Perth by the river – to which the Greek portico of the 1818 County Buildings (the county hall and court house) adds further distinction. Plus, Perth also has The Horsecross – an umbrella body running Perth Theatre and Perth Concert Hall. Perth Theatre is over 100 years old, an Edwardian theatre of great charm and with a loyal audience. In 1935, it was home to the first repertory company in Scotland – though in 1633 its predecessor held a performance for King Charles I in honour of his visit to Perth! Perth Concert Hall was opened in 2005, and makes not only a huge contribution to the arts in Perthshire, but also an important architectural statement in the centre of Perth. There is a very active year-round programme of concerts, comedy, dance, musicals, contemporary art, film, talks, arts workshops – plus conferences and other events. So, to summarize, Perth is an old-established burgh on a historic site in an attractive setting with a go-ahead cultural life and a nice environment. Taken together, it’s a city that’s worth a visit. And if it had Stirling’s castle, it would be unbeatable. Find out more about Scotland's smaller cities here.